When Dan Uggla of the Marlins slugged his 30th home run Sept. 13, 2010, he became the first big-league second baseman to hit 30 or more in each of four seasons, surpassing a standard first established by a former Cardinal 81 years ago. 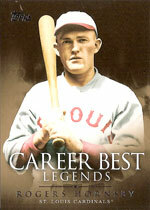 Rogers Hornsby was the first second baseman to hit 30 or more home runs in each of three seasons. Others who equaled the feat: Jeff Kent, Alfonso Soriano, Chase Utley and Uggla. Playing for the Cardinals, Hornsby led the National League in homers in 1922 (42) and 1925 (39). He hit 39 again in 1929 with the Cubs. Hornsby’s home run hitting in 1922 and 1925 was just a part of two of the most awesome offensive seasons ever produced. In 1922, Hornsby batted .401 for the Cardinals, with 152 RBI, 141 runs, 250 hits and a .459 on-base percentage. He won the Triple Crown by leading the National League in batting average, homers and RBI. The St. Louis slugger did just about as well in 1925. He hit .403, with 143 RBI, 121 runs, 227 hits and a .489 on-base percentage. Oh, yes _ he also managed the club. In May 1925, with the Cardinals in last place, manager Branch Rickey was fired and replaced by player-manager Hornsby. After managing and hitting the Cardinals to their first World Series championship in October 1926, Hornsby got into a salary dispute with team owner Sam Breadon and was traded to the Giants in December. Hornsby ranks second on the career list of home runs by a second baseman. Kent leads with 377, followed by Hornsby (301), Craig Biggio (291), Ryne Sandberg (282) and Joe Morgan (268). Easily the second greatest Cardinal of all time, behind The Man. He would probably merit that on his playing career alone, but when you add in the fact that he lead the club to their first modern era pennant and World Championship, there is no one else close.